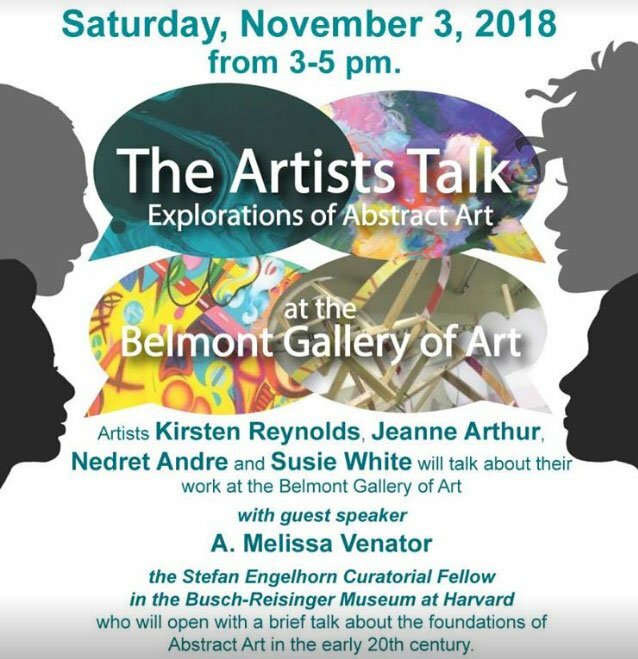 Stefan Engelhorn Curatorial Fellow in the Busch-Reisinger Museum at Harvard, who will open with a brief talk about the foundations of Abstract Art in the early 20th century. Oct. 4, 7 to 9 p.m.
As part of its “Rhythm and Hues: Art Inspired by Music” exhibit (now through Oct. 12), the Belmont Gallery of Art (BGA) presents a special gallery talk and performance “Words and Music” with artist Woody Giessman at 7 p.m. on Oct. 4. Giessman, the special featured artist in “Rhythm & Hues” is the former drummer for the Del Fuegos, founder of Right Turn Recovery and survivor of a near-fatal brain aneurysm two years ago. Woody will talk about his life and work, art-making techniques and inspiration–while also treating attendees to a live music performance. The event is free and open to the public. Cider and sweets will be served. Questions about “Words and Music”: please contact Rebecca Richards at admin@belmontgallery.org.